Registered nurses looking to progress their career into advanced practice nursing roles may want to become a nurse anesthetist. Certified registered nurse anesthetists (CRNAs) are highly trained medical professionals who specialize in safely administering anesthetics. CRNAs are responsible for ensuring patients feel no pain during surgical, obstetrical, therapeutic, and diagnostic procedures. From the first dose through recovery, nurse anesthetists carefully monitor patients’ vital signs for any adverse reactions. Many CRNAs work under the supervision of an anesthesiologist, surgeon, dentist, or physician. However, nurse anesthetists are the sole anesthesia providers in over 67 percent of U.S. rural hospitals. As job growth skyrockets by 31 percent through 2024, more nurses should follow these steps to become a nurse anesthetist. First, aspiring nurse anesthetists must begin their education by earning a Bachelor of Science in Nursing (BSN) degree from a four-year college or university. Most BSN programs consist of two years of general education and two years of nursing coursework. Make certain the bachelor’s program is properly accredited through the CCNE or ACEN. Curriculum will build mastery in health assessment, human anatomy, physiology, microbiology, chemistry, and pharmacology. BSN degrees require completing at least two clinical rotations. Keep your grades high because nurse anesthetist programs often require a minimum 3.0 GPA. After graduation, it’s suggested that you take at least two years off from school to gain real-world nursing experience. Many master’s programs for nurse anesthesia require applicants to have practiced in medical-surgical nursing. So, schedule to take the National Council Licensing Examination (NCLEX-RN). Certain states will have extra requirements, such as passing a criminal background check and fingerprinting. With a registered nurse (RN) license in hand, you can begin applying for entry-level nursing jobs. Future nurse anesthetists often find work in intensive care units, cardiac care units, surgical centers, and ambulatory care clinics. Next, begin applying to graduate schools offering a Master of Science in Nursing (MSN) program with a specialty track in nurse anesthesia. For an MSN, nurse anesthetists must complete at least 27 months of full-time attendance in a rigorous curriculum. Master’s in nurse anesthesia programs should be fully accredited through the Council on Accreditation of Nurse Anesthesia Educational Programs (CANAEP). Coursework will train nurses to accurately operate anesthesia equipment and administer the drugs. Mandatory clinical rotations will cover everything from tonsillectomy and hysterectomy to open heart surgery. Last but not least, nurse anesthetists must pursue certification to qualify for independent practice. Certification is granted through the National Board of Certification & Recertification for Nurse Anesthetists (NBCRNA). Becoming certified requires earning an MSN, unrestricted RN licensure, and a passing score of the National Certification Exam (NCE). Currently, this exam has an overall pass rate of 81 percent. Testing centers are scattered across the United States. After passing, CRNAs must complete 40 hours of continuing education biannually. Nurse anesthetists striving for upper-level administration could also pursue a Doctor of Nursing Practice (DNP). 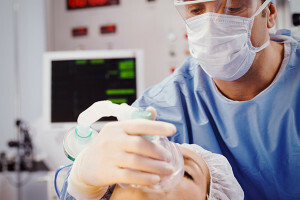 Nurse anesthetists are skilled APRNs given the responsibility of administering general or local anesthesia to numb pain in surgical or emergency situations. According to the Bureau of Labor Statistics, CRNAs are well compensated with an average yearly salary of $158,900, or $76.40 per hour. Although the educational journey to become a nurse anesthetist is intensive, it pays off with a financially and intrinsically rewarding job in surgical medicine.